TONIGHT: The Mudcats continue a seven game home stand tonight with game one of a three game series versus the Fayetteville Woodpeckers at Five County Stadium. Tonight's game is the first ever meeting between Carolina and Fayetteville. The Woodpeckers are an affiliate of the Houston Astros and previously played in the Carolina League as the Buies Creek Astros the last two seasons. The Astros were last year's Carolina League champions after winning the Mills Cup Championship in a winner-take-all single game championship finale versus Potomac last September. ICYMI: Rob Henry drove in a run with a double in the fourth and Payton Henry stretched his hitting streak to eight straight games, but the Mudcats fell 5-1 to the Blue Rocks on Sunday afternoon at Five County Stadium. Wilmington's Seuly Matias homered twice in the game for the Blue Rocks as they finished out a series win, by taking three of four, in the four-game set. Christian Taugner started for the Mudcats on Sunday and ended up suffering the loss after allowing three home runs, including an opposite field homer to Blake Perkins in the first and Matias' big flies in both the fourth and sixth innings. ABOUT THE LAST ONE: The Mudcats were held to just one run on five hits in yesterday's loss to the Blue Rocks at Five County Stadium. The were additionally held to a combined two runs and nine hits over both games of Saturday's doubleheader. The Mudcats ended up batting just .191/.274/.255 over their four game home series against Wilmington. They also averaged just 2.5 runs per game and were out scored 20-10 in the series. TONIGHT'S STARTER: Carolina's Opening Night starter Bowden Francis gets the start for the Mudcats in tonight's series opener versus the Woodpeckers. Francis last pitched on April 10 in Potomac where he worked through five scoreless innings with five strikeouts. Francis pitched around two first inning walks, walked three overall and allowed just three hits over his five frames while earning his first win of the season his last time out... Francis started the 2018 season with Low-A Wisconsin before earning a promotion to High-A Carolina last August. He went 5-8 with a 4.41 ERA over 22 G and 19 GS (104.0 IP, 29 BB, 95 SO) last season with Wisconsin and 2-2 with a 4.88 ERA over 4 G and 4 GS (24.0 IP, 9 BB, 11 SO) with Carolina. TRENDING: Payton Henry has hit safely in eight straight games and is batting .333/.357/.444 (9-for-27, 3 2B, 5 RBI) during the streak (3 2B, 5 RBI). Henry is additionally hitting .333/.429/.417 at home (4 G, 4-for-12, R, 2B, 2 RBI) versus .259/.310/.333 on the road (7 G, 7-for-27, 2 2B, 3 RBI). WHERE THEY RANK: Joantgel Segovia is currently 7th in the Carolina League in batting (.368) this season. Segovia is also tied for 3rd in the CL in on-base (.478), 6th in slugging (.605), 4th in OPS (1.084) and tied for 8th in hits (14)... Ryan Aguilar is currently tied for the league in doubles (5) and is tied for 3rd in walks (7)... Dylan File is currently tied for the CL lead in strikeouts (15). MUDDIES V. WOODIES: The Mudcats were 11-17 versus Buies Creek overall last year, including a 5-6 record at home and 6-11 record on the road. Carolina additionally went 7-16 overall against the Astros in 2017; 3-8 at home and 4-8 on the road. Carolina entered the 2019 season 18-33 all-time against Houston's High-A Carolina League team (8-14 at home, 10-19 away). HOW THEY'RE BUILT: The Mudcats open the 2019 season with 11 returning players from last season... The 2019 squad features three of the Brewers' Top 30 prospects (as rated by MLBPipeline.com) including OF Tristen Lutz (No. 5), C Payton Henry (No. 10) and C Mario Feliciano (No. 22). PLAYOFF DROUGHT: The Mudcats failed to reach the playoffs again in 2018, stretching their current playoff drought to seven consecutive Carolina League seasons. Carolina has additionally failed to reach the playoffs in 10 consecutive seasons overall between their time in the Carolina League (2012-Present) and Southern League (1991-2011). 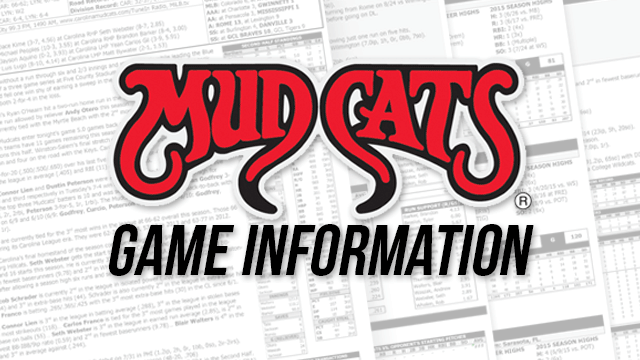 The Mudcats last reached the playoffs in 2008 when they lost to the Mississippi Braves in the Southern League Championship Series… Current post-season droughts in MiLB (full-season teams): Buffalo (AAA)/Delmarva: 13 seasons, New Orleans (AAA): 11 seasons, Iowa (AAA): 10 seasons, Hartford (AA): 9 seasons, Louisville (AAA): 8 seasons. ALUMNI REPORT: 2018 Mudcat Dillon Thomas went 3-for-4 with a double and a walk for Double-A Biloxi in last night's 5-4 loss to the Biscuits in Montgomery. Thomas currently leads the Southern League in OPS (1.292), slugging (.792) and on-base (.500). Thomas is also currently 2nd in the SL in batting (.417), tied for 3rd in RBI (7) and tied for 1st in doubles (4). ... played in Zebulon, NC since 1991 (29th season). ... played in the Carolina League since 2012 (8th season). ... been an affiliate of the Brewers since 2017 (3rd season). ... operated under the ownership of the Brewers since Oct. 2017.